Mangaluru, Mar 27,2017: Two bike borne assailants have brutally attacked a youth at Kodi near Ullal late night on March 26, Sunday. 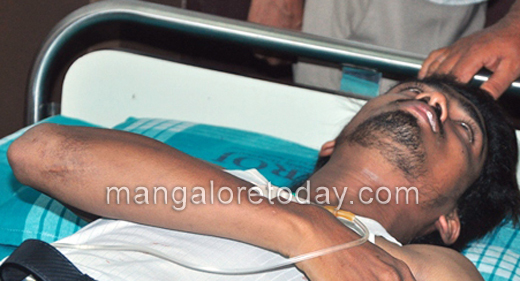 The injured youth has been identified as Naushad(22) of Ullal Kodi. The incident occurred at around 12 midnight when Naushad was heading towards Ullal from Kodi. Two bike bore assailants waylaid him near the Ullalpete mosque, abused and attacked him with a machete. As Naushad tried to prevent the attackers, his left hand has been severely injured. Locals who came to know about the attack rushed Naushad to a private hospital. Naushad has revealed the name of one of the accused as Rameeth from Mogaveerapatna and another person also named as Ramith. It is said both who were arrested in connection with the case of attempt on the life of Ibrahim Nahsan were released from prison just on March 25. Senior police officials have visited Ullal and have ensured strict vigil in the area to prevent untoward incidents. Work of some uneducated jobless brutes.......This is to disturb the communal harmony .